You'll find Health Radar jampacked with easy-to-read and easy-to-apply help for your optimal health and wellness. and sky-high medical costs . . .
lives of your loved ones . . .
Be Careful Whom You Trust Your Health To . . .
Quite frankly, what your average medical doctor doesn't know about your health could literally get you killed . . .
Doctors are so busy these days they just don't have time to keep up with the latest treatments and advancements in medicine. Plus, many are "old school" — biased against simple and natural strategies that can make such a difference in your health. Don't rely on one overworked doctor. Not when you can have an entire team of health experts looking out for your best interests. IMPORTANT NOTE: Sales tax included where applicable. 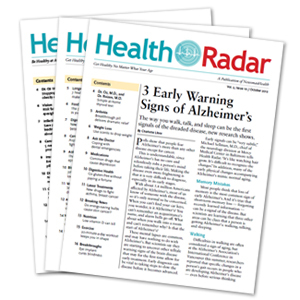 Your subscription to Health Radar comes with convenient automatic renewal. At the end of your subscription, we'll notify you. If you want to keep the publication, do nothing and we'll renew your subscription using your credit/debit card on file and charge you the lowest renewal rate then in effect. There is no risk, you can cancel within the first six months for a full refund of the unused portion of your subscription.